Canada’s position on the world stage continues to embarrass and disturb. It’s a lengthy document, but worth the time it takes to read. As you read through the resolution, ask yourself why any decent human being would oppose it. Surely, only racists, bigots and nazis could find this resolution offensive. In this instance, it seems likely that the US and Canada chose to vote with Ukraine because of the influence of neo-fascists in Ukraine’s government. I found myself wondering if parts of this resolution might apply to Israel’s oppression of Palestinians – thus providing another incentive for Harper to remain on the wrong side of justice (and history). Not surprisingly (also on Nov. 4th), Canada was one of a handful of nations to vote against a draft text on the right of the Palestinian people to self-determination. The resolution was supported by a record vote of 170 in favour. Seven were opposed (Israel, Canada, Marshall Islands, Micronesia, Palau, United States, Nauru), and six abstained (Cameroon, Central African Republic, Kiribati, Paraguay, Rwanda, South Sudan). The Harper government’s stance on these two resolutions will not surprise anyone who has been paying attention. The next federal election cannot come soon enough. More than 600 indigenous women in Canada are believed to have gone missing or been murdered in recent years. The slowness of governments to act and the lack of progress where governments have acted have spurred Manitoba’s aboriginal organizations to demand full-scale provincial and national inquiries. The Assembly of Manitoba Chiefs, Manitoba Keewatinowi Okimakanak and the Southern Chiefs Organization have written to Prime Minister Stephen Harper, urging that he hold a national inquiry that would look at all aspects of the issue. The Chiefs have sent a parallel request to Eric Robinson, Deputy Premier of Manitoba and Minister of Aboriginal and Northern Affairs. Both letters are available on the web site of the Assembly of Manitoba Chiefs. So far, Manitoba’s and Canada’s governments have shown no interest in public inquiries. Manitoba’s Justice Minister, Andrew Swan, claims he does not support an inquiry because it could “get in the way of a criminal investigation” that led to the arrest of Shawn Cameron Lamb on charges of killing three aboriginal women in Winnipeg. The AMC, MKO and SCO held a rally in Winnipeg on July 11, 2012. Several hundred Winnipeggers marched from the Forks National Historic Site to the TD Centre near the corner of Portage and Main in support. Here is some of the video I shot at this event. 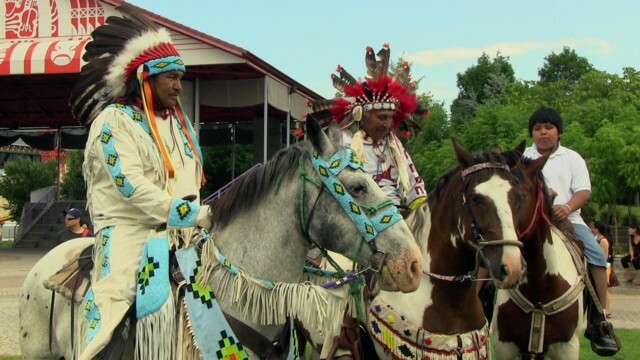 Featured in this video clip are Assembly of Manitoba Chiefs Grand Chief Derek Nepinak, respected community elder Mae Louise Campbell and David Harper, Grand Chief of Manitoba Keewatinowi Okimakanak.